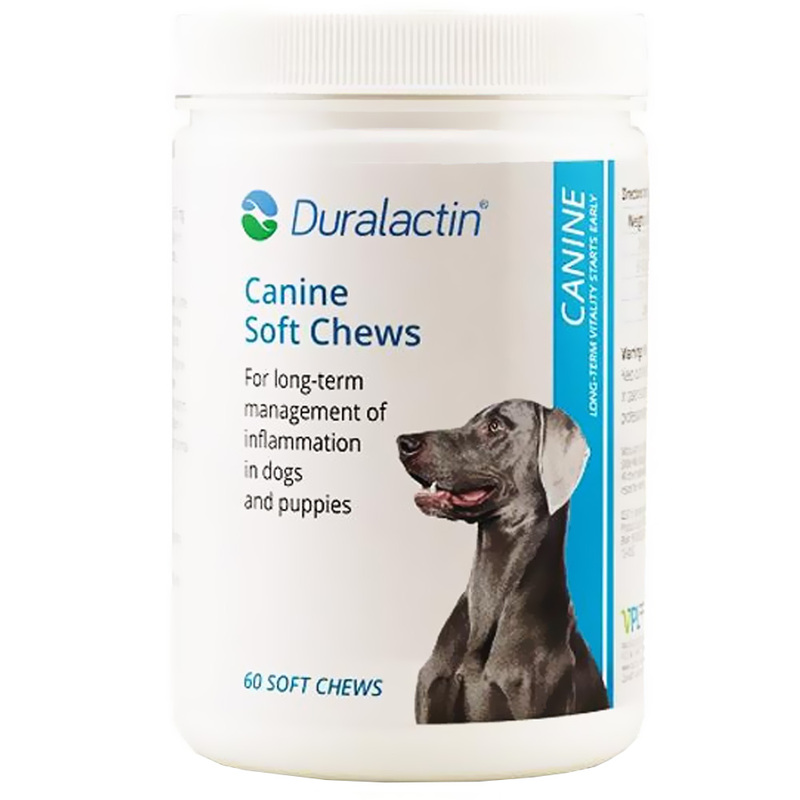 Duralactin Canine Soft Chews maintains healthy joint function in dogs. These delectable chews are formulated to provide the building blocks for synovial fluid, cartilage and connective tissues. The formulation also includes fatty acids that are vital to everyday health. Duralactin Canine Soft Chews include an exclusive ingredient, MicroLactin®, which has been extensively studied for its ability to support healthy joints. This container includes 90 soft chews but there is also a smaller size container available. Provide your pet with a joint supplement that stands out from the others and order a tub of Duralactin Soft Chews today! Inactive Ingredients: Cane Molasses, Dried Chicken Liver, Glycerin, Lecithin, Methylparaben, Mixed Tocopherols, Potassium Sorbate, Propylparaben, Soybean Oil, and Wheat Flour. Directions for Use: Give directly or feed with food. Warnings: For use in dogs only. Keep out of reach of other animals and children. In case of accidental overdose, contact a health professional immediately. MicroLactin is a registered trademark of Stolle Milk Biologics, Inc. (SMBI) All other trademarks are property of their respective owners. Cautions: Safe use in pregnant animals has not been evaluated. Some dogs may be sensitive to milk proteins. Should vomiting or diarrhea occur, or the animal's condition worsen, consult your veterinarian. If lameness worsens, discontinue use and consult your veterinarian. Recommended to help manage inflammation. Duralactin® Canine Soft Chews contain Microlactin®, an exclusive dried mil protein concentrate derived from hyperimmunized cows that contains factors that appear to block cytokines and inhibit neutrophil participation in the inflammatory response. Duralactin® products also support normal activity and wellness.